What is the best foundation for a house from a bar? Every house must have a solid foundation that transfers the load of its weight to the ground. Houses from a bar differ in resistance to deformations and rather small weight. 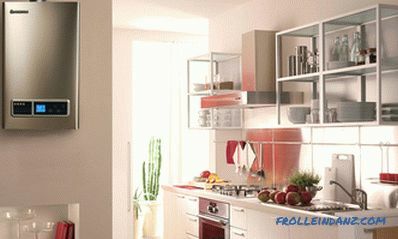 This feature reduces the requirements for supporting structures for them. In ancient times, chopped huts were placed on large stones or even on decks of larch. Today we have a choice of several types of designs. The stronger and more reliable the support, the better, but excessive mass is the extra cost, which is not always justified. The type of soil, its hardness, heaving, stability of wetting. Groundwater level, precipitation, seasonal humidity, and relief. Availability of basement, availability of materials, economic calculations. Before deciding which foundation to choose for a house from a bar, you should study the properties of the soil in the construction site. Here the bearing capacity, mobility, heaving are important. According to the structure of the base are divided into several types. Bases in the form of rock or dense embankment of solid fragments have the highest bearing capacity, and their behavior is practically independent of moisture and groundwater levels. Belt and column fine-buried and non-buried foundations work well for them. In these soils is very difficult, and often impossible to arrange a basement under the house. 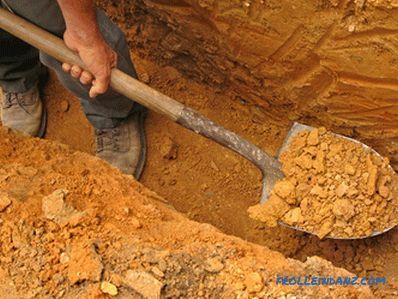 Soils with a high content of sand are among the stable and reliable bases for the house. Good drainage qualities of sand practically exclude frost swelling except for cases of flooding above the level of freezing. With a consistently low groundwater level, any type of foundation can be used. With seasonal warming the best choice would be pile or columnar, with the bottom deepening below the freezing depth. Clay soil in a dry condition has a bearing capacity comparable to stone. But its properties change dramatically when moistened. In addition, it has the property of heaving when freezing. 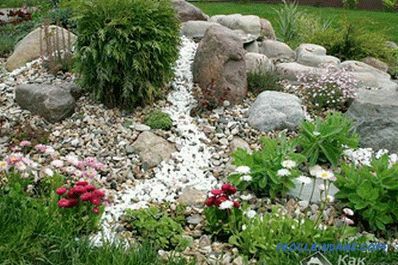 If the groundwater does not come close to the base of the basement, and the surface layers are protected from precipitation and flood water, then any foundations are equally effective on clay, provided that measures are taken against frost heaving. 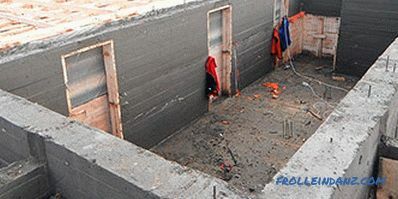 If the rise of groundwater or flooding is possible, it is better to put the house on a monolithic slab of reinforced concrete. If at the same time there is a dense rock at an accessible depth that can serve as a support, then you can make a pile foundation with a rigid harness that turns the pile field into a single structure. There are different types of foundations. Each of them has its own area of ​​greatest efficiency. Structurally, this is the simplest foundation. It is located under all bearing walls and has the form of a continuous tape. 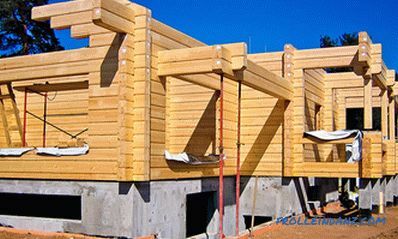 Due to the large footprint, it has a high bearing capacity and can be used for heavy walls and structures. 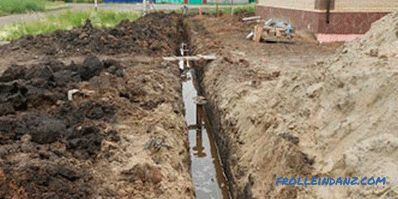 By the depth of the foundation, strip foundations are divided into non-buried, buried, and shallow-buried. Subterranean foundations are used under heavy structures and are laid below the ground freezing level to eliminate the effect of frost heave on the sole. The deep strip foundation forms walls for basements and semi-basements. 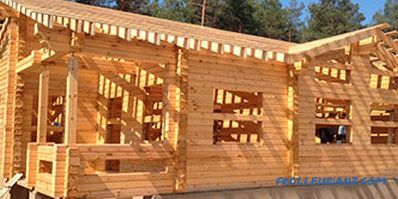 For light constructions, such as single- and two-story wooden houses, such a construction is justified only in the case of a cellar or basement under the building. 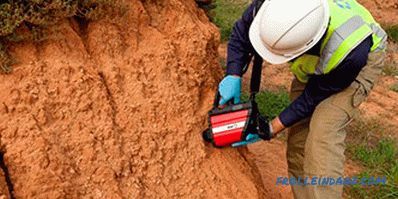 A light structure resting on the deep layers of the soil exerts too little load on the base, which in some cases can cause a loss of stability. The influence of lateral and tangential frost heaving forces on heaving soils is especially strong. 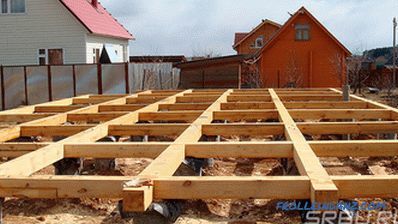 Shallow-deep foundations are often used in rural housing construction. Under them, trenches with a depth of up to 0.5 m are torn off, a cushion of drainage materials - coarse and gravelly sand, rubble, gravel is placed in them, it is thoroughly compacted and stone or concrete support tape is arranged on top of it. This design is much cheaper both in materials and labor. The draining pad compensates for vertical frost swelling, while lateral and tangential loads are negligible due to the small area of ​​contact between the lateral surface and the ground. Belt footings are used on any reasonably stable basis.They should not be used on weak, heavily flooded and flooded soils. 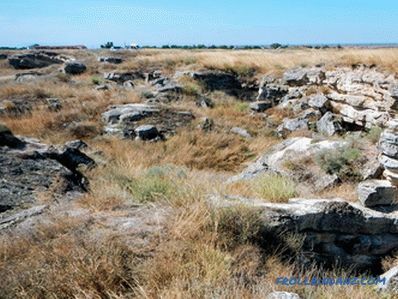 The column foundation is a series of supporting pillars made of stone, brick or concrete, connected by grillages. This design allows to significantly save materials and reduce the amount of earthworks. But due to the technical complexity of the grillage device, significant savings are obtained only with a sufficient vertical base size, which results in a large difference in the volume of materials compared to the tape type. 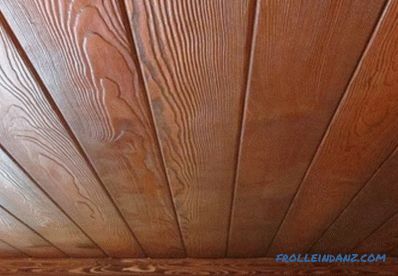 The lower trim of the log house assumes the function of load distribution on the poles. This partially removes the problem of grillages and expands the range of economic benefits of column supports. 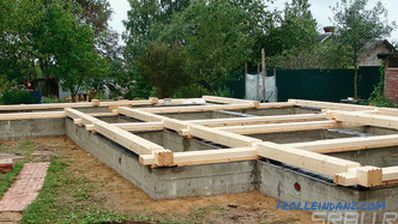 It is possible to construct a shobchaty foundation on clay soils, to a depth of freezing, if it is planned to build a house without a foundation. If, due to soil properties, climatic and hydrogeological conditions, the foundation is laid to a greater depth - 1.5 m and more, then the complexity of the construction of pillars increases sharply. Here we are entering the area of ​​efficiency of pile foundations. A screw pile is one of the types of piles used in construction. For private construction screw piles are best suited, since their installation does not require heavy special equipment. Depending on the diameter and depth of immersion, each pile can be installed by 2-3 people or with the help of a compact power plant, which is easy to deliver to the construction site. Screw piles are excellently kept on weak and marshy ground. They are insensitive to frost heaving, and the ease of their immersion allows the structure to be supported on deep, dense layers. The foundation on screw piles can be used on clayey and sandy foundations, when the groundwater is near, on flooded areas, on the shore of a reservoir, on a coastal bank. 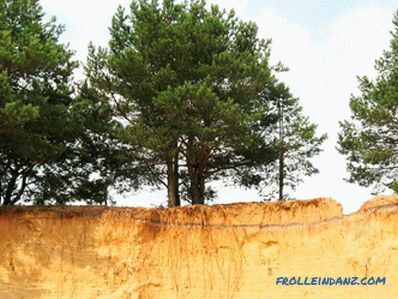 The only limitation for them is rock and coarse soils. 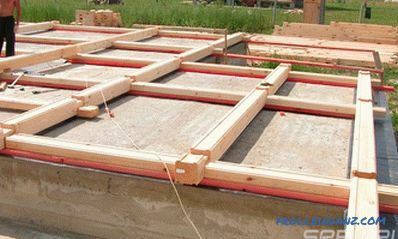 The slab foundation is a rigid monolithic slab of reinforced concrete. Such a plate has a very large support area, so it is able to maintain stability even on the weakest soils. With properly calculated penetration, such a foundation is called floating because its carrying capacity does not depend on the hardness of the base. The load created by the weight of the structure is balanced by the pressure of the soil, even in a plastic state. It is advisable to use such a foundation for a lumber house on loam with a high level of groundwater, as well as on unstable sandy soil. 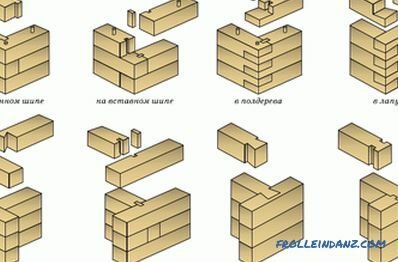 To choose the best foundation for a house from a bar, you need to take into account all factors, including the elevation difference in terms of the house, the possibility of shifts and landslides in the surrounding area. On the basis of the above descriptions of foundations and grounds, general recommendations can be given. 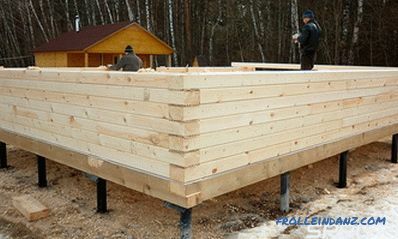 On detrital and rocky soil, a log house should be placed on a strip or columnar non-buried or shallow-buried foundation. On a sandy base - on a columnar low-depth, and if you need a basement, then on a strip base. On clay soils, it is necessary to use columnar with a depth below freezing or pile. Tape - for the device basement. It is better to use a slab foundation on a weak foundation, with a silt or over-wetted. When building on a steep slope, you should take into account the lateral pressure of the soil on the pillars and walls. Any soil, other than rocky, behaves like a liquid for large periods of time. He seeks to push the submerged structures, and overthrow those standing on the slope. On a steep slope, screw piles demonstrate the greatest stability, since they have a developed anchor part, a rigid harness and a relatively thin trunk. Choosing a foundation for a home is a challenge for professionals. And yet, to navigate in this matter can and should be. I hope this article will help avoid gross errors.